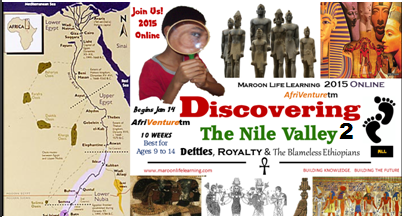 This AfriVenturetm is created to introduce young people to the Wonders of the ancient African Nile Civilizations. Who were the Pharaohs? What secrets did they leave buried in the ground? What did they believe in? What are the stories of their lives? The participants will journey through the past to Discover, Learn and Adventure! This AfriVenturetm is best for ages 8 to 14. It Consists of 10 weekly 1.5 hour classes. Where: ONLINE OPEN To You Wherever You Are In The World!